Tangy, spicy heat massaging my vocal cords. Roasted mustard seeds, cumin, garlic and pepper steaming towards my nose. Each maintaining a soft cadence under direction of the nutty paste of toor dhal. Filling my belly. Warming my throat. Reviving my olfactory senses. Cold cold go away. Please don’t come back another day. R and I were not only lucky enough to have avoided the Northeast’s recent winter storms, but we also managed to be spending that time exploring Costa Rica’s warm beaches and monkey and sloth filled rainforests. After ten days of sand and adventure, however, it took only 12 hours of being stateside for a nasty cold to infiltrate my sun kissed, post-vacation high. Merry x-mas me. I convinced R that if he wanted to get me back in shape, he had to feed my cold like my dad would – by making a steaming bowl of Tomato Garlic Rasam. It was a little surreal to sit in the kitchen and relax, giving R instructions and watching him sort through my masala rack and pans. Surreal but well worth it. Especially since once once you learn, you can’t un-learn (moihaha). *Amount may very depending on the type of rasam powder and your desired spice. First, rinse and pressure cook the toor dhal with 1/4 tspn. turmeric (Indira at Mahanandi has a nice post paying homage to toor dhal)*. Lightly mash the cooked dhal. Second, heat about 1/2 tspn. of oil in a saucepan then add the mustard seeds, red chilis, curry leaves and garlic. Toast until the mustard seeds sputter and the garlic starts to become golden. Third, add the chopped tomatoes and cook on medium heat until the tomatoes melt. Fourth, add about 2 1/2 cups water and rasam powder and bring to a boil. Fifth, stir in the tamarind paste and the toor dhal and bring to a gentle boil again. Add salt to taste and sprinkle with freshly chopped cilantro. Taste the rasam and adjust the amount of tamarind (sourness), rasam powder (spice) and water (consistency) as needed. Serve hot over basmati rice. Serve with a side of Lay�EUR(TM)s original potato chips (yes, Lay�EUR(TM)s – ask any South Indian, US based family – it�EUR(TM)s instant papad with just the right amount of crunch and salt and perfectly sized to scoop up rasam soaked rice) and even a smidge of lemon pickle. You can also serve it as an appetizer or, when downtrodden with a cold, drink a steaming mug of it plain. *I use a Fagor Pressure Cooker and find that 1 cup of toor dhal requires about 10 minutes of cooking with no pre-soaking. Unfortunately, my Am�EUR(TM)rikan pressure cooker doesn�EUR(TM)t whistle like my mom�EUR(TM)s desi version, but it�EUR(TM)s comforting to know it�EUR(TM)s been tested for US consumer safety standards (for whatever that�EUR(TM)s worth since pressure cookers still scare me). Many Indian recipes indicate pressure cooking time by number of whistles so you have to just take a try-and-see approach to cooking times. 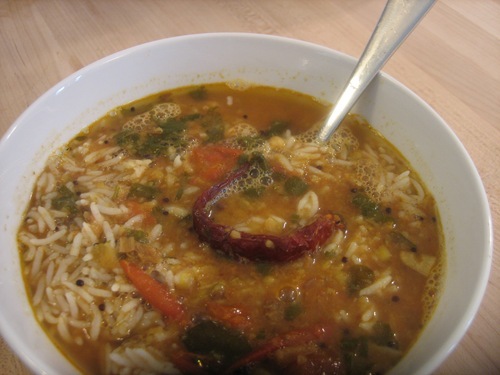 Updated: For those who didn’t grow up eating rasam nightly, rasam is a South Indian tomato soup that is also called chaaru, char or saaru…if you were in a South Indian restaurant, it would likely be served as an appetizer and described as a “spicy tomato and lentil soup.” There are a number of different variations. You can also entirely omit the toor dhal for a more liquidy, quicker version. I love the way you write…very entertaining. Not all food blogs are like that. Amrikan 🙂 just the way any Punjabi would sound like. Do you make your own Rasam powder? Wait let me guess… ready made 777 brand? Foodie, I’m using Rasam Powder that I bought from the Ganesh Temple in Flushing, NY but otherwise, 777 or MTR would be my choice. Good guess! Thanks for the compliments! Raj, Daddy’s charru makes party in my belly too! When I have my Dad’s chaaru, it making party in my belly. It make birday pardy in my belly, too! Heya i’m for the primary time here. I came across this board and I in finding It truly useful & it helped me out a lot. I hope to give something again and help others like you aided me. were to create a killer post title? I am not suggesting your information is not good. click. You might add a video or a picture or two to get readers excited about what you’ve got to say. In my opinion, it could make your website a little bit more interesting. uncertainty could be instant in your thoughts, then there would certainly be the questions. The insurance companies are usually trying to cover their own backs. In addition, seniors can also look at getting specialist coverage. paying for anyway, on the policy that you chose to buy. you shop for insurance protection. Drawback: (a) Client does not get renewal notice 60 days before expiry. Different states will have different rules regarding health policies and what they have to cover. What an easy way to decrease the value of your car. Clearly these decisions above our heads but our goal is to make sure you can compare apples and apples when quoting California health insurance. subjecting maternity benefits to a maternity deductible sepatate from the normal medical deductible.